SPX: Even though the week was shortened the market has finally managed to break out of the channel it has been caught since early November. I've already mentioned it several times, that I have some problems with the correct wave degree in the short term count. The reason for that is wave (b). Already in my Update for Week 51 I wasn't sure where to place (b). As you can see in the chart there are three possible places for (b). The first (b) would make the correction a simple flat, the second one a double three and the last one a contracting triangle. While all of these wave patterns are very common I think the most likely one is the triangle. Wave (a) lasted 11 trading days. So, let's say that wave (c) also lasts 11 trading days. 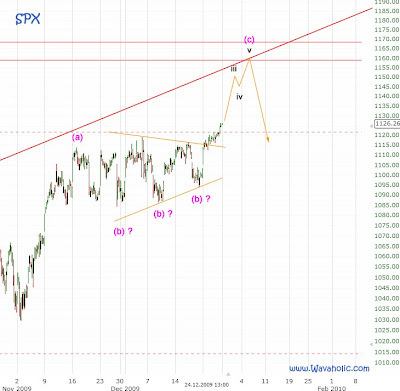 Taking the triangle (b) wave low (1094 on December 18th) and adding 11 trading days we get January 5th 2010. That's exactly between the two dates I expect the top. So, from now on, I'm going to place wave (b) at 1094. The target for wave (c) though remains the same.